Remedy's sweet ride receives a new coat of paint. 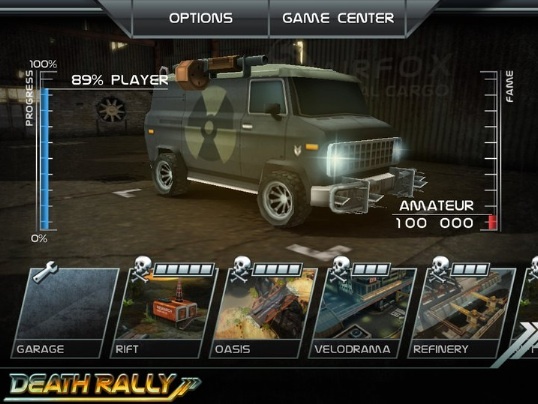 When it comes to vehicular combat, most players know Sony's Twisted Metal franchise, but others have fond memories playing Death Rally, a PC racer from Alan Wake developer Remedy Entertainment. This top down speedster puts you behind the wheel of a heavily armed car in a world where anything goes. Crossing the finish line was the primary objective, but shredding enemies with machine guns and dropping landmines onto the tracks meant you didn't have to play nice. Fast forward 15 years later, and the game will make a triumphant return on iOS for both the iPhone and iPad, except this new version received a much-needed facelift. The result is an App that retains the spirit of the original but packs an explosive visual punch. Death Rally will launch with five cars: the Vagabond, Sentinel, Dervish, Shrieker and Deliverator, each of which look unique and feature different stats. The Sentinel, for example, is a standard looking and slow moving van. This runs contrary to the Deliverator, the game's fastest car that is a breeze to handle. That said, it's in your best interest to perform well during races to enhance these vehicles. Succeed, either by completing races or destroying adversaries, and the game awards you with cash used to upgrade stats (speed, handling, armor). You can also strap different weapons and items onto cars inside the garage, and the list runs the proverbial gamut, including a shotgun, gatling gun, sniper rifle, mines, missile launcher and bumpers to push enemies around the tracks, of which, there are four. All of these environments sport attractive scenery, explosive barrels, item boxes (cash, nitrous, ammo) and shortcuts. If you prefer to drive through a modern city, Velodrama will help you scratch that itch. Rift, on the other hand, takes place in a jungle, while Refinery is more industrial. Finally, there's the desert themed Oasis. What's especially cool about the game, aside from blowing other cars to pieces, are the cameos. Duke Nukem will make an appearance, as well as Barry Wheeler (Alan Wake's agent), John Gore from Chillingo's Mini Gore and finally, Angry Birds' Mighty Eagle that also functions as a weapon; soars in and crashes rival cars. 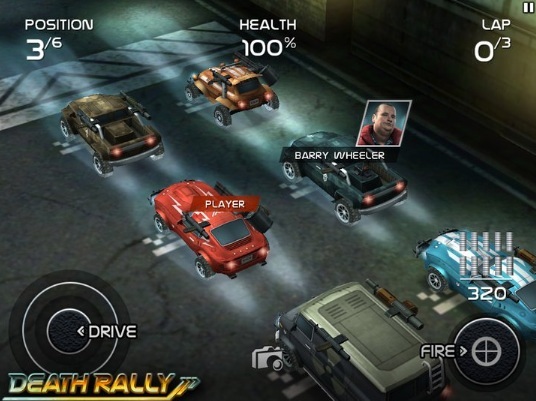 On top of that, the App supports Game Center, and Remedy has updates on the way that'll bring more cars and multiplayer, something that'll bump up Death Rally's appeal considerably. As for its release, look for the game sometime this month/early April, and keep that missile launched loaded and ready to fire.